Hist, hist! I hear my mother call! In pledge of promis’d truth, that’s all. The mill, the mill’s the place. She calls again; I must away! The score that Samuel Arnold gathered for The maid of the mill comprised an overture and no fewer than thirty-seven numbers. Most of these were lifted from pre-existing works, many of which cannot now be identified, but Arnold did write four new numbers himself—two finales and two airs. 'Hist, hist! I hear my mother call' enjoyed particular popularity, and shares marked similarities (they have the same key, the same tempo marking and the same dramatic context of whispered, conspiratorial subterfuge) with the short duet for Susanna and Cherubino from Act 2 of Mozart’s Le nozze di Figaro, composed twenty-one years later. 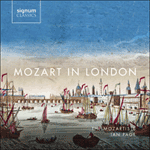 Of course we cannot say with any certainty that Mozart recalled this air when writing Figaro, but it would come as no surprise if he had, given the impressionable age at which he was exposed to such a wide range of music during his time in London.